Plant height: 3 - 10"
Sundews trap insects on the sticky, muciligenic hairs then digest them. 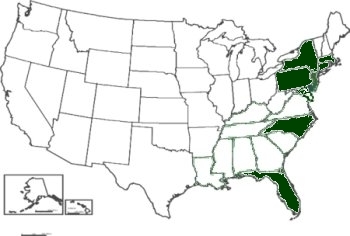 New Jersey has three species of sundews: spatulate leaved (intermedia), round leaved (rotundifolia) and thread leaved (filiformis). 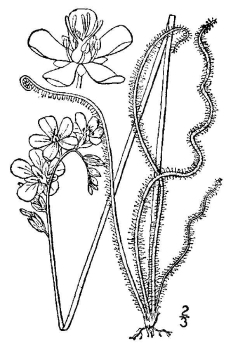 Witmer Stone, in 1910, wrote: "This is a far handsomer species than either of the preceding (D. rotundifolia, D. intermedia) and from the nature of its growth far more conspicuous. The large crimson-pink flowers are open only during part of the morning on sunshiny days, closing up at other times like the Portulaca of our gardens. 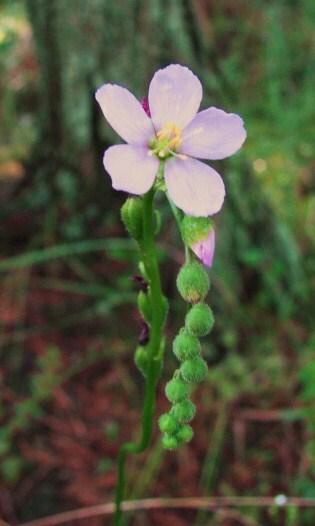 The plants prefer open damp sand, where they are not shaded or crowded by other vegetation. Sometimes they grow very abundantly in such spots, and I have seen their erect filiform leaves in rank upon rank, the glutinous secretion on the glands glistening in the sunlight and making the whole patch look like dew covered spider webs, such as we frequently see on an early autumn morning. When examined closely the leaves will always be found to have small flies, mosquitoes and other insects attached tho their thread-like glands" (469). Copyright (c) 2005-2010 Citizens United to Protect the Maurice River and Its Tributaries, Inc.. All rights reserved.